An ijinle is deep talk. Within the Agbole, however, the ijinle specifically refers to an important meeting held by adult members of the Agbole community. 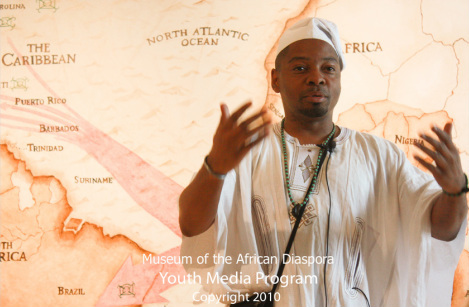 Obafemi Origunwa has introduced the ijinle as a therapeutic intervention whose primary purpose is to heal the spiritual, cultural and social traumas African Americans have suffered during 250 years of slavery, 90 years of Jim Crow, 60 years of segregation and 35 years of state-sanctioned red-lining*. In general terms, an ijinle is a small group dedicated to the discussion of 16 specific principles of spiritual development. Through the ijinle, community members get together to sort out the problems that affect everyone. Everyone has a voice and there is an attempt to find a common mind or a common story that everyone is able to tell when they go away from it. The objective is for all participants to depart from the ijinle and be able to say "This is how we approached the matter at hand. This is what we heard from one another. This is where we arrived as we prayed and thought and talked deeply together." The Greeks used a term, metanoia; it meant a fundamental shift or change, or more literally transcendence ("meta" --above or beyond, as in "metaphysics") of mind ("noia," from the root "nous," of mind). In the early (Gnostic) Christian tradition, it took on a special meaning of awakening shared intuition and direct knowing of the highest, of God. In the psychological theory of Carl Jung, metanoia denotes a process of reforming the psyche as a form of self healing. According to Jung, metanoia indicates a spontaneous attempt of the psyche to heal itself of unbearable conflict by melting down and then being reborn in a more adaptive form. Jung believed that psychotic episodes in particular could be understood as existential crises which were sometimes attempts at self-reparation. Metanoia is a deep paradigm shift. From the perspective of Orisa Lifestyle, metanoia can be easily likened to spirit possession, wherein an ancestral spirit or a deity displaces the ego consciousness of an individual in order to give prophecies, warnings and - most importantly - to heal. Whereas action, like choice, is indispensable to the spiritual quest, what the ijinle requires of you is not activity but awakened receptiveness to the ancestral insights. In this way, the ijinle seeks to create a deliberate conversation wherein the voices of the participants are in perfect harmony with the frequency of the particular entity who is best-suited to bring about healing personal and collective. And so, in the ijinle you learn directly from the ancestors how to bring about the Good Condition.